That was the question heard at the New Hampshire statehouse Tuesday when a handful of Republican men showed up for a hearing on a proposed “red flag” gun confiscation bill wearing strings of pearls with their usual blazer-and-necktie business clothes. Activists who gathered to support the proposed gun restrictions took the pearls to be a symbol of insult, directed at the women of the Moms Demand Action organization. 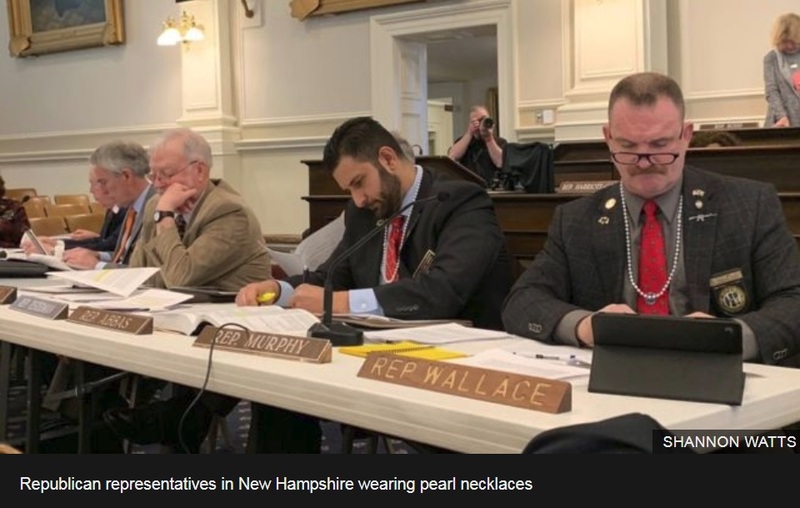 Pictures of guys in pearls quickly spread across social media, and the New Hampshire GOP lawmakers were soon being attacked as bullies across the United States. Several national figures and Democratic presidential candidates Cory Booker and Kamala Harris tweeted denunciations of the lawmakers. “We’ve used pearls as a symbol of support for the right to bear arms — particularly the right of women to defend themselves — for years,” Kimberly Morin said. Morin is president of the New Hampshire Women's Defense League, a pro-Second Amendment organization that opposed the “red flag” gun law being debated on Tuesday. In fact, its members were at the statehouse on Tuesday passing out the strings of pearls so that legislators, both men and women, could show their support. Members of the N.H. Women’s Defense League wear their trademark pearls to the state house in Concord, NH. They shudda wore matching MAGA hats. why??? ... you out of fake news to submit here at CC? I'm starting to think this guy serves no purpose but division and hatred. He is getting worse and worse with his hatred. Banning should be in order. I would have to agree Republican rep were falsely accused by the Moms Demand Action organization which is what the article is about. The BBC article continues on to explain. New Hampshire Republicans communications director Joe Sweeney told the BBC News: "The pearls were distributed by the Women's Defense League of New Hampshire - a group that trains women in self-defense through the Second Amendment. Since President Trump left the G7 summit early in June of 2018 accusing Trudeau of lying and stabbing him in the back, Canadians who support Trudeau began embracing an ugly anti-Trump movement in retaliation. Evidently, Locutus is one of them. I don't think the "back lash" against Trump among some Canadians has anything to do with the G7 summit. Why is a call for ban needed when there is disagreement on subjects? Sounds like communism to me😜. 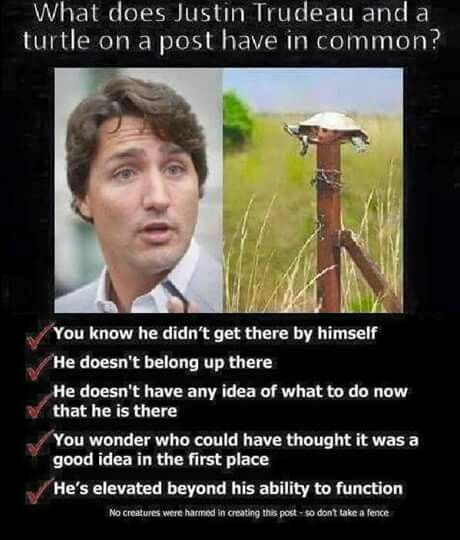 No Canadians support Trudeau. We are all actively supporting his resignation for being a corrupt, lying, thief and loser, or his imminent defeat at the polls on Oct 19, 2019! He's just one of those people who supports everything that is Liberal while claiming to be fair-minded and non-biased. He's just one of those people who supposes everything while claiming to be fair-minded and non-biased.